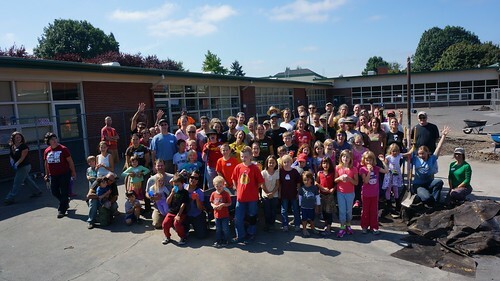 On Saturday, September 14, 2013 over 75 volunteers converged on the Lewis Elementary School playground to remove 1800 square feet of pavement to make way for a rain garden. With the help of a local organization, Depave, our team worked to remove a portion of our paved playground to set the stage for the creation of a rain garden. The rain garden will help to solve a rain water runoff problem that results in the formation of a small lake near rooms 10 and 12. It will also create a habitat for birds and insects and will provide a space for science activities for our primary classrooms. We thank our community and the volunteers from Depave (depave.org) for their help making this project possible. We would also like to thank Otto's Sausage Kitchen, Franz Bread, and Trader Joe's for their generous donations of food to help feed our crew. Our own Mr. Colvin set up his camera and created a time lapse photo of the work that took place on Saturday. Lewis Elementary Depave Project Timelapse--9-14-2013 from Paul Colvin on Vimeo. From Depave's http://depave.org mission statement: Depave promotes the removal of unnecessary pavement from urban areas to create community green spaces and mitigate stormwater runoff. Through community partnerships and volunteer engagement, Depave strives to overcome the social and environmental impacts of pavement with the use of action-oriented educational events, community stewardship, and advocacy to reconnect people with nature and inspire others. Depave is a nonprofit organization based in Portland, Oregon.